Editor’s Note: ﻿﻿ Due to some exciting developments in my writing life — my novel, Adrift in the Sound, being named a finalist in the The Mercer Street Books Fiction Prize competition and negotiations to publish it, there isn’t a new post for the Word Garden this week. I’m editing the book manuscript now with the help of a friend — novelist Tom Thomas — and getting it ready for what comes next, which is taking a lot of time. I’ll get back to talking about gardens, books and the great outdoors ASAP! In the meantime, I’ll keep you posted on any new developments and work on the next post for this site. Thanks so much for being part of the growing number of Word Garden visitors (we set a record for visitors last month!) and for your patience. Your interest and kindness help me keep going. ﻿﻿ The grand migration is getting under way in the Sacramento Valley and I’m excited to enjoy the spectacle. I have tickets for a boat tour into the Sacramento-San Joaquin Delta marshes to view and photograph Sandhill Cranes in November. Last year we got rained out. But that’s just one of the more than 350 migratory bird species that are descending by the millions and millions in the next few months. 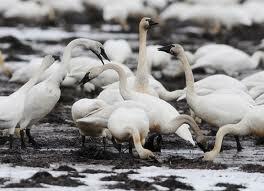 Another is the majestic tundra swan, pure white and with a wing span of more than 7 feet. I live on the Pacific Flyway, a major north-south route of travel for migratory birds in America, They fly from the Arctic Circle and the frozen tundra to places as far away as Patagonia in South America, following food sources, heading to breeding grounds or travelling to overwintering sites. Waterbirds require many types of wetland habitat. And, the confluence of the Sacramento and American river, where I live, offers much of what migratory birds are looking for—marshes, managed wetlands, flooded crop fields and water delivery canals. It’s the interconnectedness of wetland habitats and rice fields that surround our community that creates such a suitable spot for so many of these feathered travelers. All are breath-takingly beautiful, especially the swans. Known by many in North America as the “whistling swan.” During migration and through the winter, tundra swans inhabit shallow lakes, slow-moving rivers, flooded rice fields, and coastal estuaries, the kind of habitat found within blocks of my house. During the breeding season, tundra swans forage mostly on the water, using their long necks to reach as much as three feet below the water’s surface for food. A large and long-lived species, they form long-term pair bonds, sometimes mating for life. ﻿﻿﻿﻿ Living with these magnificent creatures makes it easy to understand the sensual reverence for swans common in many of the world’s cultures. 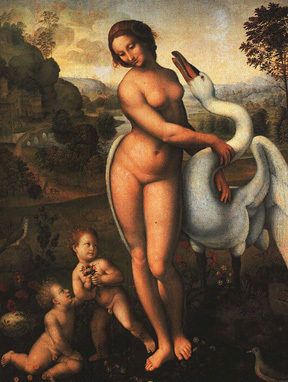 In Greek mythology, Zeus seduces Leda, the mother of Helen of Troy, disguised as a swan. The Irish legend of the Children of Lir is about a stepmother transforming her children into swans for 900 years. In Norse mythology, there are two swans that drink from the sacred Well of Urd, the water so pure and holy that all things touched by it turn white, including the original pair of swans. Swans are revered in Hinduism and compared to saintly persons whose chief characteristic is to be in the world without getting attached to it, just as a swan’s feather does not get wet although it is in water and its migratory nature means it doesn’t have a permanent home. 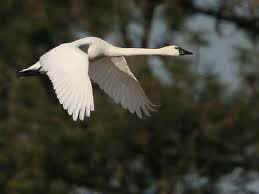 To see swans in flight is awesome. Flying in a “V” formation, the lead tundra swan does more work than those that follow. Flying in formation allows the birds that follow to take advantage of the air currents produced by the wings of the birds ahead. When the leader tires, a more rested bird comes from behind to lead the others, helping the birds cover their yearly 8,000 mile round-trip migration, one of the longest of any waterfowl. 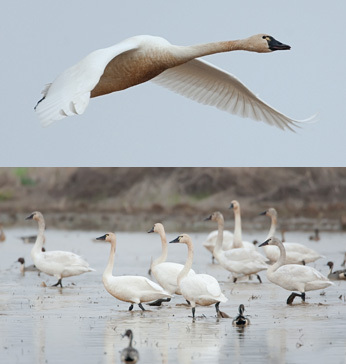 If you’re in California and would like to witness this amazing event, the state Department of Fish and Game is offering naturalist-led swan tours of Marysville’s Rice and Waterfowl areas this November through January. Co-hosted by local rice farmers and land owners, these tours will focus on tundra swans, as this area is one of the best locations for seeing swans in California. But, ducks, geese, cranes, shorebirds, white pelicans, herons, egrets and raptors, including bald eagles, are also commonly seen in this area. The tour area encompasses 23,000 acres of rice fields and restored habit not normally open to the public and offers a glimpse of how rice is farmed in the Sacramento Valley to provide food and bird habitat, including areas favored by the majestic tundra swan . Tours will be held Saturdays from 9:30a.m. to 11:30 a.m. and 1 p.m. to 3 p.m. They are driving tours along a short route with very little walking required, which is good for small children and those with mobility issues. For active hikers, the tours may not provide adequate outdoor opportunities. Pre-registration is required and is offered on the DFG website, www.dfg.ca.gov/regions/2/SwanTours.